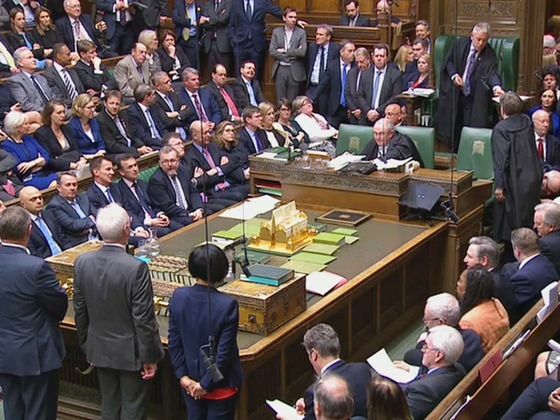 Theresa May’s last-ditch effort to get her Brexit deal through Parliament failed, leaving the U.K. with the choice of crashing out of the European Union in two weeks or being trapped for many more months in the bloc it’s been trying to leave since 2016. Parliament rejected her divorce deal by 344 votes to 286 on Friday, a third defeat for an agreement that the EU says is the only one on offer. May had offered to quit as prime minister in a bid to get the deal over the line, but even that was not enough to win over the pro-Brexit hardliners in her Conservative Party. May now has three options: go back on her word and lead the country out of the bloc without a deal on April 12; ask the EU for a long extension to rewrite her whole Brexit strategy; or call a general election as a way out of the impasse. Parliament on Monday will vote on various alternatives to May’s strategy. The pound fell following the vote and was at $1.2997 as of 2:46 p.m. London time, down 0.3 percent on the day. If a majority emerges for a softer Brexit, as expected, May will have to decide whether to do as she is told and risk a rebellion; or call an election on the basis that Parliament is asking her to deliver something that goes against previous campaign pledges. Friday was meant to be the day the U.K. left the bloc after more than 40 years of membership and almost three years of wrangling over the divorce. Instead, the political infighting and paralysis continues, with business, investors and citizens frustrated by the relentless uncertainty. The impact on the economy was laid bare by figures Friday showing that business investment has fallen for four consecutive quarters, the longest run since the financial crisis a decade ago.